Heinz Mack is one of the founding member of the hugely influential ZERO movement, an artistic group which crystallised in Germany in the second part of the 1950s. The term ZERO was coined in 1957 by Mack and Otto Piene to describe their artistic endeavor, and it later came to define the International Art Movement born out of their radical gesture. The central concerns of the movement were to do with the harmonious balance between the natural possibilities of the medium itself and the artificial intervention of the artistic hand. Far from considering these two elements in opposition, ZERO strove to create a dialogue between the two, one where the aesthetics would be as pure and organic as possible, allowing for the work’s true voice to emerge, facilitated by the artist’s intervention. The relationship between Fontana and Mack started in 1959, when Mach visited Milan and met the Italian artist, who was almost a generation older and had already been a powerful influence on the ZERO group. 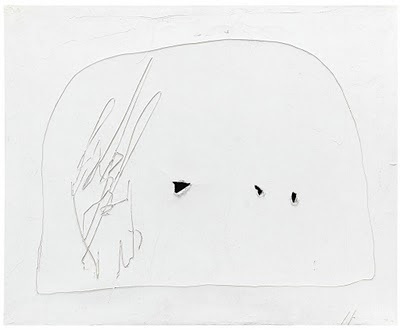 Lucio Fontana’s ideology of Spazialismo shared many of the concerns central to the ZERO movement, and in the years that followed the two artists developed a close bond and an ongoing artistic dialogue. The bringing together of these two collaborators is beneficial to both artists. The slashes look less of a gimmick, more drawn and composed and the drawn looks less formal.